Let our team provide paving services to create the perfect spot in your Mooresville yard. When you need a new paved surface in your outdoor space, you can always rely on the professionals at Lake Norman Signature Pools & Patios. Taking advantage of the pleasant weather we have here in Mooresville, North Carolina is easier when you have a place to sit and relax, so let our team provide paving services to create the perfect spot in your yard. Leaving your paving project to someone who doesn’t know what they’re doing can result in a number of issues, including bumpy and uneven surfaces, unfinished sections, or gaping holes in your paved area. 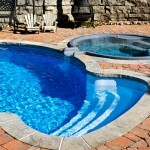 We specialize in the paving of pool decks, patios, and fire pits, so we can create any of these options in your backyard. Adding a patio creates a perfect place to relax with your friends and family members while grilling your favorite foods or sipping drinks. If you’ve always dreamed of having a fire pit, we can design and construct the ideal spot to enjoy the ambience and warm up on a chilly evening. Installing a swimming pool and paved pool deck at your property is also one of the best ways to increase the value of your home while adding a place to make memories with your family and friends. When it comes down to it, whatever vision you have for your outdoor space can be made a reality with help from our team. Call us today to learn more our paving services!